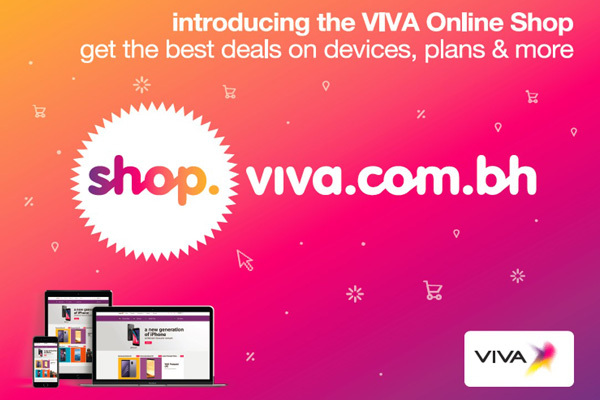 Bahrain’s online shoppers can now visit Viva Bahrain’s online store at shop.viva.com.bh to purchase the latest devices and mobile plans. Marking the launch, Viva introduced attractive cashback deals only available through the online shop and on some of the market’s best-selling smartphones such as the iPhone X, Samsung A8+ and the newly released Samsung S9/S9+. Among the deals is an exclusive BD50 ($132) cashback on the iPhone X and Samsung S9/S9+ which online shoppers can benefit from today by buying online. In addition, online shoppers who purchase their favourite devices through the new online store with a new Viva plan are rewarded with double data for three months. The latest Viva Postpaid plans are also being offered with exclusive data benefits only available for online shoppers. “We’ve launched the Viva online store with differentiated user experience and proposition, benefiting from Bahrain very high internet penetration and young population demographics. It’s also a time where Bahrain’s digital economy is thriving and this step particularly meant to build on that success and tap into the growing needs of today’s connected consumers,” said, Karim Tabbouche, Viva’s chief commercial officer. With its intuitive design and user-friendly interface, the Viva Online Shop offers a convenient and unique shopping experience. Online shoppers can simply browse the shop and customise the device of their choice by selecting the storage, colour and the mobile plan with it. Much to the excitement of Bahrain’s online shopping community, the delivery options are among the best features of Viva's online shop. All orders placed online are delivered for free within just two working days. Upon placing the order, online shoppers are contacted by Viva’s dedicated delivery agents to schedule the drop-off time and tracking information is instantly sent via SMS. Online shoppers can also log in to Viva App to track the orders’ delivery status. Another option allows online shoppers to pick-up their orders through a dedicated fast-track at Viva’s outlets.